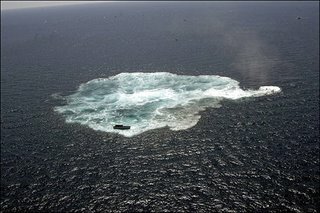 The remarkable pictures below show the scuttling of "The Mighty O," formerly commissioned as the U.S.S. 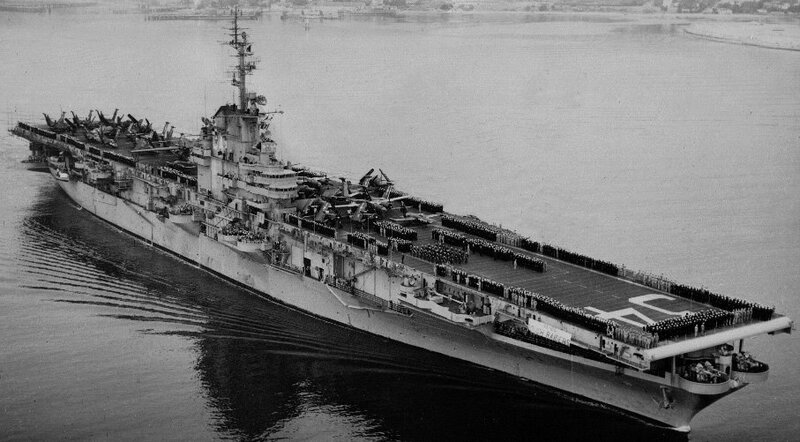 Oriskany, an 888-foot-long aircraft carrier that had a 25-year history of service to the Navy. 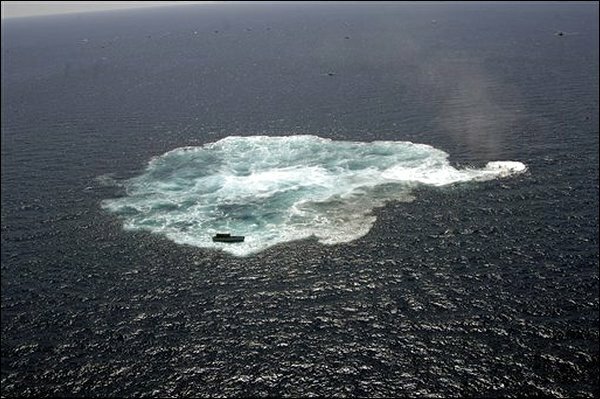 Twelve days ago, on May 17th, she was sunk some 24 miles off the coast of Pensacola, Florida, to become the world's largest artificial reef. Some 45,000 sailors are believed to have served on the Mighty O in her long career. One of them was Senator John McCain, who was captured by the North Vietnamese and held as a prisoner of war for six years after taking off from her decks. The reef that the Mighty O has become will serve sightseers, divers, and sports fishermen, and is expected to generate millions of dollars for Pensacola's economy. Decommissioned, retired, even forced to suffer that most ignominious of fates for warships, sunken—but still useful, still honored—and not forgotten. What better symbol of faithful service? 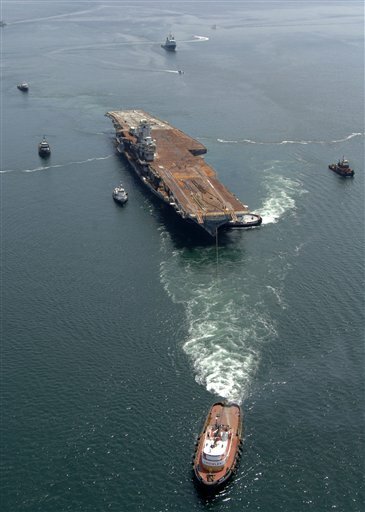 What's the story on the final carrier launch -- the boat (looks like an SUV parked overtime in the picture from the stern) that was apparently gently lifted off the deck with the final crew on board as the waters swirled over the carrier deck, somehow kept horizontal. BTW, the final picture only shows up as a thin strip in thumbnail. 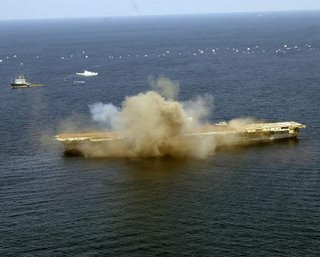 I was told that the small boat on the carrier deck contained a generator and electronics to set off the explosions. 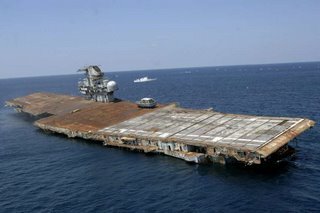 It was designed so the small boat would float free after the carrier sunk. It took 37 minutes for it to go down. This is the most honorable ending for a ship of this type. It becomes something with a name, something that continues to exist and be rememebered, something that will be marked on a map for centuries to come. The alternative is (as we said with sadness when I served in the Navy) is to send it to some third world country to be 'turned into razor blades'. It's amazing to think of the number of people who haved served and the memories they have of life on a ship in wartime. My father served on a hospital ship and several years ago I contacted national archives and had some prints made of the ship he served on as a gift to him; brought back many memories for him, and many stories he never told me before.